Situated in a calm alley, a few steps away from the famous Jemaa El Fna square, after the busy street of Derb Dabachi, you will pass through an ancient arched door. You will be seduced by its authentic ceiling in cedar and the spacious lounge/dining room with chimney. Bathed in sunlight, this area is a privileged space to spend time in family during the hot hours of the day or during the winter evenings by the chimney. This beautiful air-conditioned lounge with generous spaces, leads to the kitchen where a cook is at your service to prepare delicious dishes. The lounge is equipped with a DVD player (and collection of DVDs) and internet 3G key. The 2 bedrooms (one with a double bed and the other with 2 single beds that can form one) have a bathroom in ocher tadelakt with shower and tub, and toilets. The stairs lead to a comfortable room and its terrace with beams and Beldi ceiling. It has a double bed with ironwork and bathroom with toilets. The bathroom is in yellow-sand color tadelakt and has a wash basin in brass, and a beautiful shower with traditional arch door. This room lets in all the sunlight, and you will be able to see the snowy Atlas Mountains from your bed through the large bay window. This room is air-conditioned for your utmost comfort. - Beds and cleaning are done every day. Quiet and calm. Great service from everyone involved. We wish to have you in our house for your next trip. Loved having you as guests... Thank you! We stayed here for several nights and everything was pretty much perfect. With two couples staying in the larger rooms, we had the run of the Riad. We arranged a pick up from the airport through the property owner, Aurelie, and everything went smoothly even though our flight was several hours late. When we arrived, Halima- the truly wonderful staff/ cook/ housekeeper- had prepared an amazing meal for us, fed us on the rooftop terrace, and then allowed us to go crash into our respective beds. We highly recommend eating the meals Halima prepares- it's an additional charge, but very affordable and truly some of the best food we had in Morocco. In addition, the Riad is very close to the main square of the Medina- well located for long winding walks through the many close streets of shops and restaurants that form the heart of Marrakech. The accommodations are lovely in every way- do stay here! The Derb Dabachi must be one of the craziest roads in the world. The main route from the West to East side of the mid-Medina (and vice versa), in places it is only three metres wide, and packed with shops, street vendors, and farmers bringing their daily produce in to sell. In the evening it’s like letting out time from a major football game, and you dodge mopeds, carts and donkeys to make your way through. In the middle of this you turn off into a dark alley, then go left, left and left, past kids playing alley football, and you find a door next to the Riad Boussa. Up a flight of stairs and you reach a gorgeous living room, with a small kitchen, two double bedrooms and a bathroom to the side. Another flight of stairs and there is a fine bedroom which opens out to a beautiful roomy terrace, with views of the Marrakech skyline. The terrace really is the place to be, to lounge with a book and a drink in the shade looking out to a clear, warm sky. Despite the nearby Dabachi it’s very quiet, apart from the occasional sounds of the call to prayer, the distant drums of the Jamaa el-fna, and alley football. The housekeeper Halima is wonderful. She cooks a sumptuous breakfast for €3 a head, which she will serve on the terrace should you wish it. I would also recommend her 3 course dinners at €12 per head, some of the best food we ate in Marrakech. The place is an oasis of calm within chaos. I would thoroughly recommend this property. This Riad was very authentic and was exactly the experience we were hoping to have. We thoroughly enjoyed our stay and would stay here again. The rooftop terrace is supercute and a very relaxing place to lounge in the sun. The riad is very conveniently located to the main square although it is extremely quiet (no traffic noise) which was wonderful. The housekeeper Halima made us feel extremely welcome. She was very professional, polite and courtoeus. She is a great cook, we were served a traditional moroccon breakfast every day and there was great variation to it from day to day, our kids really enjoyed it too. She cooked dinner for us twice and it was by far some of the best food that we had in Marrakech, much better than some of the restaurants we ate it. I would definitely recommend this to anyone looking for a genuine moroccan riad adventure. We are delighted to see that you had a great stay at the riad Douiria Jdida. 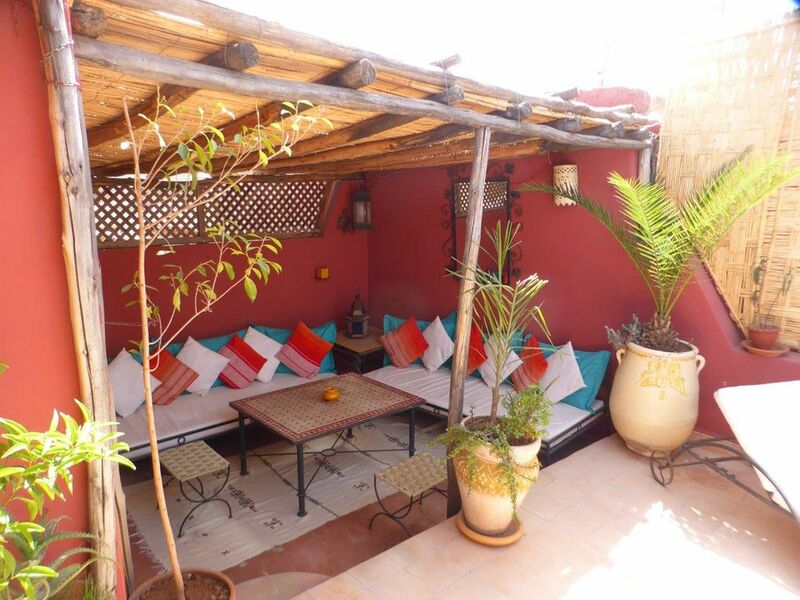 Our house is located in the center of Marrakesh Medina, 8 min walk from Jemaa el Fna square.